Crossrail has been good in keeping Londoners and others informed about designs and what is happening, with constant updates to the News page on their web site. Last month, HS2 started the contractual process to find a builder for the HS2 station at Old Oak Common. But there is nothing about it on their News page, which is just a load of press releases. I have found this picture of the proposed station in several places on the Internet. But where is the detailed information page, which explains it all? I found this map of the rail lines in Wikipedia Commons. It would appear that the rail line going along the North side of the common in the visualisation is the Great Western Main Line, which will also be used by Crossrail. 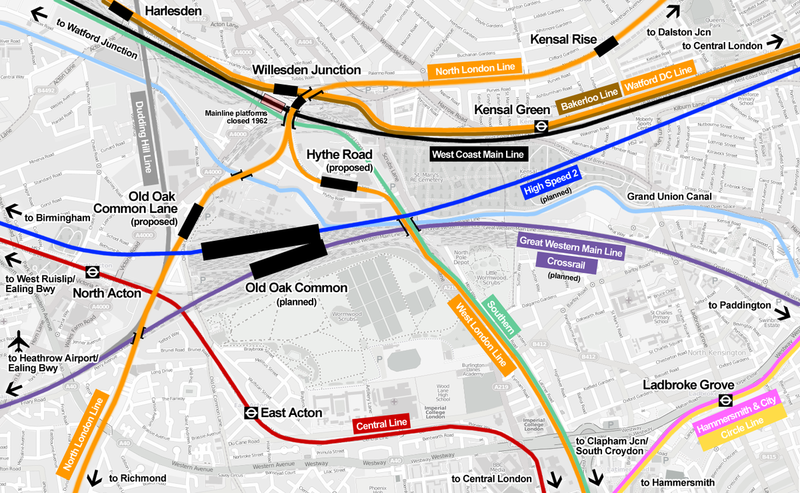 It appears that the rail loop in the foreground of the visualisation, which is not shown on the map, is to allow Crossrail trains to access the North London Line. There must be another proposed loop or viaduct to allow trains to connect to the Northbound West Coast Main Line. This would allow Crossrail to be extended to Watford and Milton Keynes. Where is the definitive map and information from HS2? 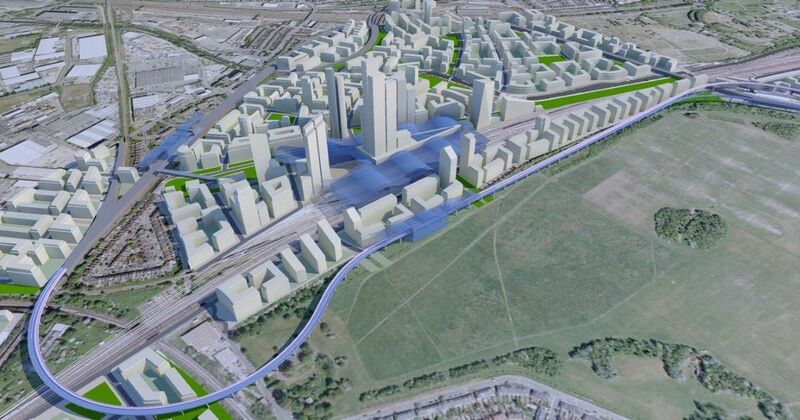 Old Oak Common station will affect travel plans for millions of travellers to and from most parts of London and a lot of places in the wider South East. No wonder, there are people who don’t want HS2 to be built, if they have no information! So why aren’t HS2 following the same news and information route, that has been successful for Crossrail? And no direct end-to-end connection with HS1! So no direct trains to/from the continent to Brum and the North. I know! The only route would be by the North London Line, which probably couldn’t fit 200 metre long trains to the European gauge. I suspect though that we could see an easy interchange at Old Oak Common to Crossrail and if they extended that lime to Ebbsfleet with a good intervhange, that would probably be quicker than Euston to St. Pancras on the Tube. I’ve checked out your links ijmad and, it could be that the visualisation dates from the time of the map. 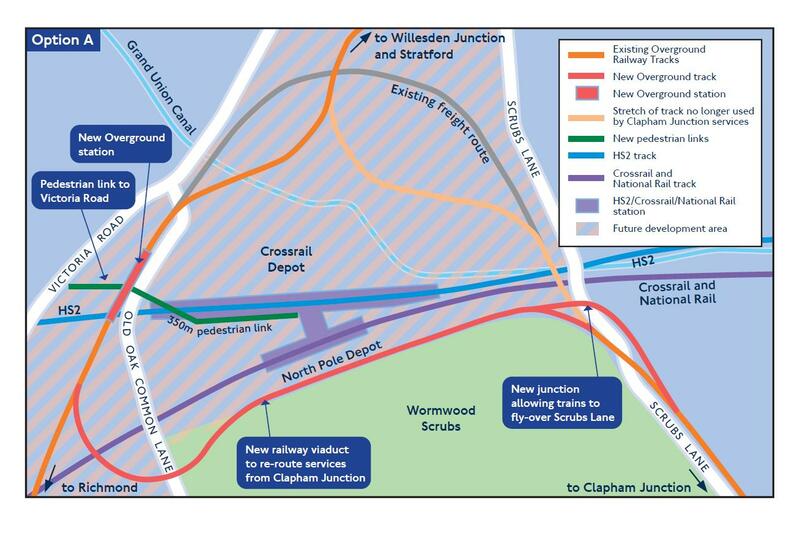 Since then, TfL have announced two new Overground stations to the North of HS2 at Hythe Road and Old Oak Common Lane. As I said, HS2 need to get their act together! Yes, I think there was a lot of local pressure to avoid the land take required for the re-routing of the lines for Option A, so it seems Option C is now TfL’s preferred option, with two separate stations. Can’t say I think it’s a wholly satisfactory solution — the interchange from Hythe Road will apparently be a 650m walk which stretches the definition of ‘interchange’ to say the least — but it’s what they’re now developing. no direct end-to-end connection with HS1!